Click here to register your name for a Sponsorship or Seat at a table that has already been sponsored. Click here to make a donation to the FDR DINNER. Individual and student tickets are available for purchase. For sponsorship packages please use the buttons below. Ad Journal placements are available for purchase. For information on Sponsorship levels, click here. As the only President to enter office with a physical disability, Franklin Delano Roosevelt had unique insight regarding building an inclusive society. Serving as U.S. Senator, Assistant Secretary of the Navy, and President, FDR sought to tear down barriers that limited people with disabilities. Paralyzed from the waist down after contracting polio, he created modifications, including leg braces that allowed him to stand and vehicle modifications that allowed him to drive — one still used by millions of Americans with mobility disabilities. FDR’s commitment to empowering those with disabilities continues to inform Disability Rights Legal Center’s mission and purpose. DRLC honors this commitment with the Annual FDR Dinner. 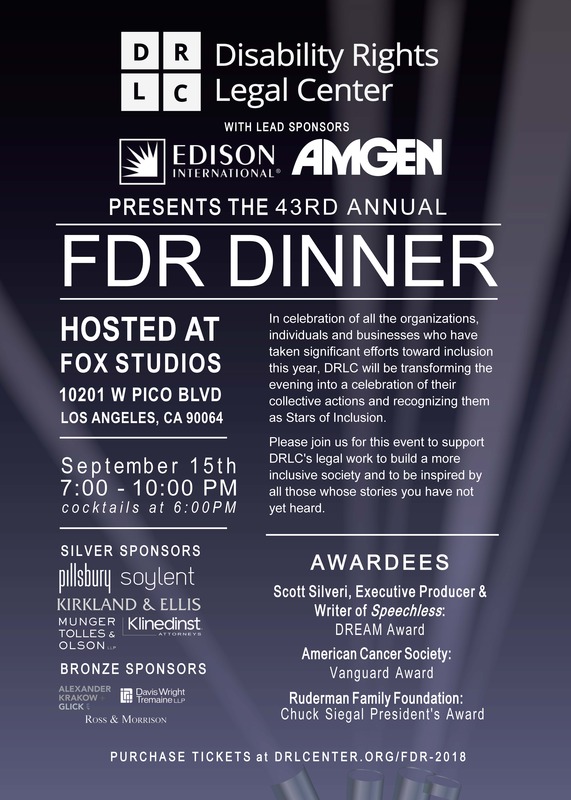 Support Disability Rights Legal Center, and FDR’s vision of an inclusive society, by sponsoring its annual FDR Dinner. For more information or to reserve participation, contact Jordan Kough by phone at 443-309-2283 or email at Jordan.Kough@drlcenter.org.